The completion of the Dubai Canal project over the next few months could help to transform the city by opening a waterway, currently stranded in Business Bay, for leisure use and by creating swathes of valuable new real estate. The 3.2-kilometre extension of Dubai Canal from Business Bay to the Arabian Gulf is progressing at pace, with an elevated southbound stretch over Sheikh Zayed Road set to be open today, allowing for the removal of the old carriageway below. Erwin Bamps, the chief executive of the luxury yacht manufacturer Gulf Craft, said that the opening of the canal will create an island of Bur Dubai and some of the city’s most prominent districts including Jumeirah, DIFC and Downtown Dubai. “It’s quite a change,” he said. He said that it would breathe more life into the creek beyond the banks of Deira and Bur Dubai, where the abras, water taxis and tourist boats currently ply their trade. It will allow for tourist cruises and RTA water taxis to travel the full length of the canal, offering views of Burj Khalifa and Downtown Dubai as they travel along it. The developer, which is part of government-owned Dubai Holding, is building out its creekside Culture Village project and recently announced plans to spend Dh1 billion developing Marasi Business Bay – a waterfront community along a 6km stretch of the existing canal running through Business Bay. Its proposals include up to 200 “water homes” supported by stilts on the canal bed, five marinas containing more than 120 berths, floating restaurants and more than 100 shops and restaurants along a new 12km promenade. Mr Bamps said work needs to be done on making the canal more accessible if this and other waterside developments are to attract tourism and investment, but that the creek offered an alternative to a densely populated Dubai Marina, which has limitations for boat owners. Anyone looking to venture into the Arabian Gulf needs to submit a journey plan to coastguards for approval before setting off. An extended canal should, in theory, offer more spontaneity for boat owners and attract more hobbyists – “smaller boat owners, who are a little bit afraid when they don’t see the beach any more”. 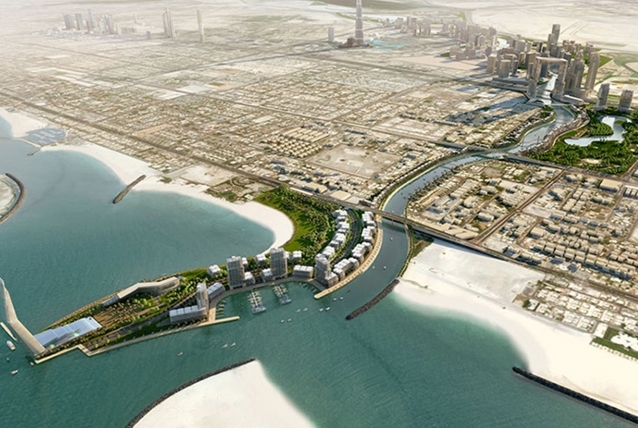 The extended canal links other current and planned projects along the creek’s banks such as Emaar’s Dubai Creek Harbour, which is set to feature Dubai’s newest tall tower and mega-mall, and Al Habtoor Group’s ­Dh10bn Habtoor City and Damac’s Aykon City. In late last month, Damac said that it had sold 800 serviced hotel and residential apartments at Aykon City ­within 12 weeks of launch, averaging five sales per day. “As long as that continues, it’s going to keep the sector busy,” he said. David Godchaux, the chief executive of the property consultancy Core UAE, an associate of Savills, said that once the canal is operational, it could thrust Jumeirah into the spotlight as a prime investment area. He said that Jumeirah is largely ignored by the investment community, because freehold land is generally not available to non-GCC nationals, although Meraas Holding’s new City Walk residential buildings is the first of several new exceptions. Mr Godchaux said the creation of substantial freehold plots alongside the canal banks “is, in my opinion, really going to establish Jumeirah as the prime district in the whole city”. He said that Dubai still doesn’t have an established prime ­central area of the city like London, Paris or New York, as districts including Downtown, Palm Jumeirah and Emirates Hills can all lay claim to being the most exclusive.